In 2003, Steve Epps took over as the head coach for Varsity Boys’ Basketball. He was assisted by Jason Malcolm. Coach Epps had been a very successful basketball coach in Virginia for years before Christ touched his heart to move to Korea. The job seemed a perfect fit. The 03-04 season was a struggle, however, as the team ended with a losing 6-7 record. 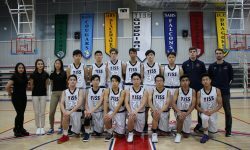 Coach Epps and the team leaders Phila Lee and Steve Kim did lead the team to victory twice over ICS-Uijongbu. This would mark the first time in school history that the basketball team beat our northern rival and sister school twice in a season. All-conference honors went to Joseph Choi as a freshman.